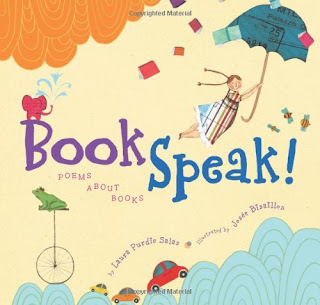 Summary: A collection of wacky, whimsical poems about books and all the treasures they contain. Laura Purdie Salas, the acclaimed author of Stampede!, is back with another collection of wild and weird, wacky and winsome poems about all the magic to be found on a single bookshelf. In BookSpeak!, each poem gives voice to a group that seldom gets a voice . . . the books themselves! Characters plead for sequels, book jackets strut their stuff, and we get a sneak peek at the raucous parties in the aisles when all the lights go out at the bookstore! Illustrator Josée Bisaillon’s mixture of collage, drawings, and digital montage presents page after page of richly colored spreads filled with action and charm. Together, Salas and Bisaillon deliver a unique collection brimming with ideas as much about spines and dust jackets as they are about adventure and imagination. What I Think: I’m so happy for this book. I set out to read more poetry in 2012 and this is the first book on my endeavor. It’s the perfect book to embark on this endeavor. I love reading books about readers and books and this book has poetry devoted to this! There is something wonderful about reading about books and readers, it’s hard to describe other than it just makes me feel like I’m cuddling up with a new book to read about reading and loving books. In terms of poetry and literary devices, I especially love the poems in this book that personify parts of a book. My favorites are A Character Pleads for His Life, On The Shelf and Under the Bed, and Index. I especially think librarians could use these poems to talk about taking care of books! I’ll spin you a rhyme. and we’ll travel through time. there’s no friend like a book. Writing Prompts: Pretend you are a book and write a story about the book's adventure with a reader. Create a poster, brochure, or video ad about how to take care of books.